Dr. Cruz was born in New York City and raised in South Florida, where after graduating high school, moved to Orlando to attend the University of Central Florida. In a quest to know the full body and mind she obtained two degrees, one in Molecular and Microbiology, and a second in Psychology. Dr. Cruz then traveled to Philadelphia, Pennsylvania to attend Temple University School of Podiatric Medicine. Returning to her hometown, she completed her residency in a high volume program at Palmetto General Hospital in Miami, Florida receiving extensive training intrauma and reconstructive foot and ankle surgery. 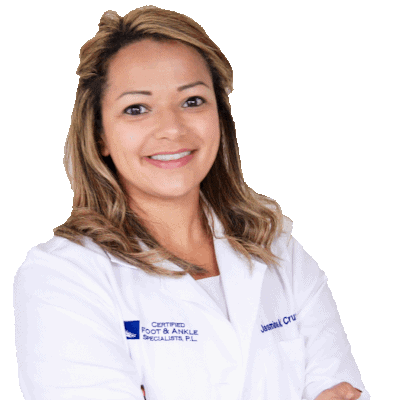 Additionally, Dr. Cruz has completed many surgical training courses emphasizing adult and pediatric foot and ankle reconstructive procedures, limb salvage, dermatopathology, and sports medicine. Dr. Cruz has continued to believe in a whole body and mind approach to medicine. She will exhaust all conservative treatment options first, using surgery only as a last option. Dr. Cruz is willing to spend the extra time with the patients to treat not just the symptoms, rather the cause of the ailments. When not in the office or local hospitals she continues to compete in long distance running events participating in multiple half and full marathons per year. Dr. Cruz spends a great deal of time finding new ways to help her fellow runners improve their stride.